Painting a hallway wasn’t supposed to renew the rivalry between West Bend East and West High Schools. 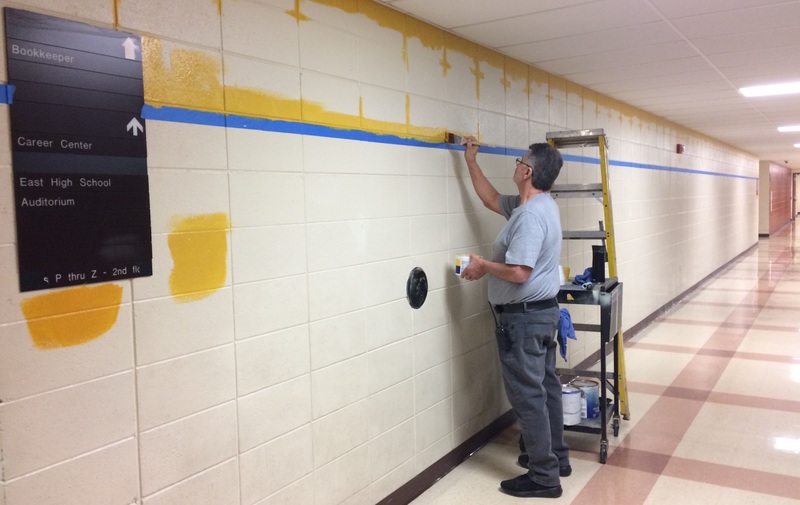 In November, West principal Ralph Schlass approved a new project of painting the west wall along the H hallway. That hallway separates the two schools with one side being a part of the West portion of the building and the other side belonging to East. Not to be outdone, the East office decided to paint the hallway’s other wall in East colors. The idea came from maintenance worker Dave Hamilton after he was asked to take down some old picture frames that had been in the hallway for years. 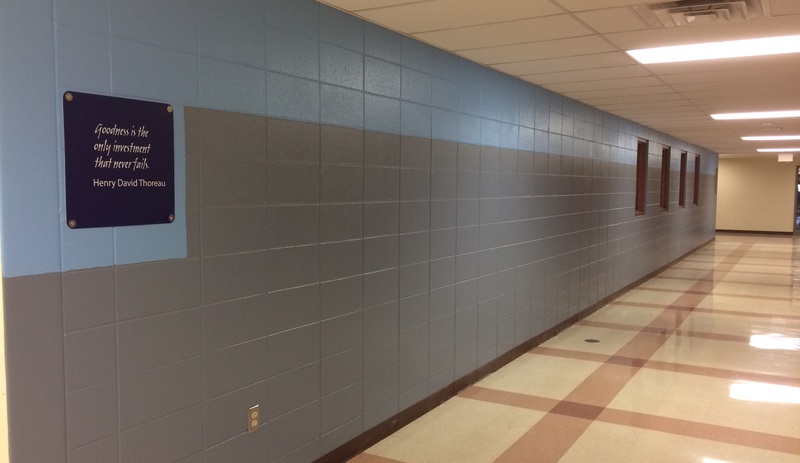 The steel blue color was added to the wall and students began to speculate whether East would add their school colors to the opposite wall. East principal Darci VanAdestine agreed that East should paint the opposite wall in the school’s gold color. But it didn’t go exactly according to plan. With the East side painted in two colors, a fun rivalry ensued. West administrators had to make it equal with two tones on the west side, too. The west side of the H hallway has two tones of blue. Photo taken today by Samantha Dietel. The H hallway will not be finished until students return to school in the fall of 2019. The painting will be continued in a similar fashion all the way to the set of the double doors near the end of the hall. Students have enjoyed the gradual makeover as new paint is slowly being added. In addition to the H hallway, the wall outside of the clinic entrance has also received new decorations. 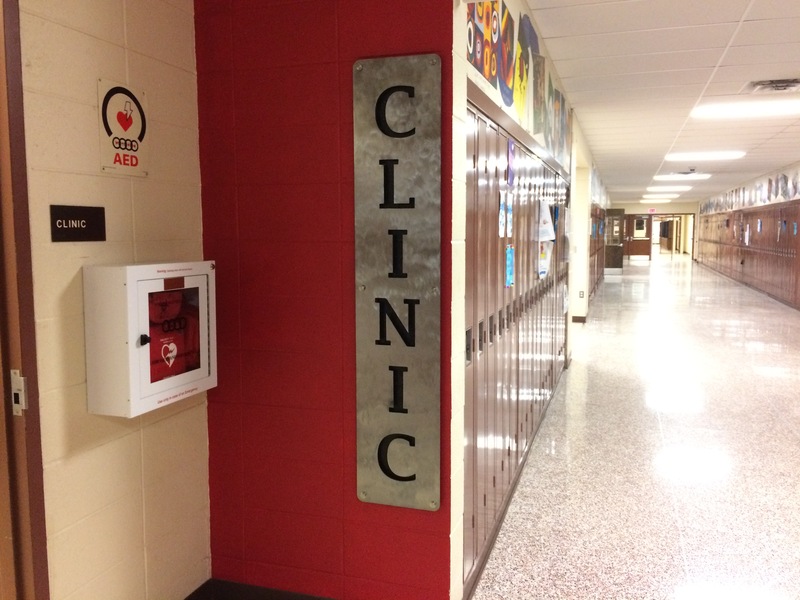 A new metal sign was made by students in the the schools’ manufacturing capstone class that reads ‘CLINIC’ in bold letters. Schlass hopes to add more color to the school in future years. Students in Jacob Gitter’s manufacturing class made a new metal sign for the clinic. Photo taken today by Samantha Dietel, Editor in Chief. 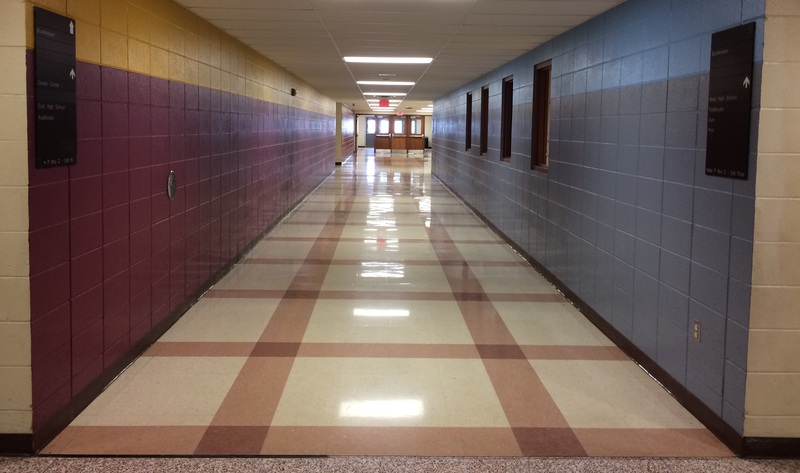 Photo of H hallway taken today by Samantha Dietel, Editor in Chief.